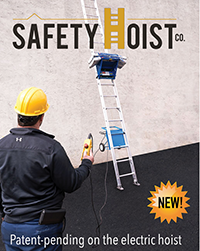 The game-changing Electric Hoist series from Safety Hoist Co. The Electric Hoist series from Safety Hoist is dominating the roofing industry with its safe design and affordable price. What makes the Electric Hoist series so special is it is the first hoist on the market to completely remove the operator from under the load with its unique pendant-controlled design. Not only that, but the material can be brought back down! The Electric Hoist series runs on regular 110V AC power supply and is easily transportable. Make the right decision and buy one today. Call us at (877) 99-HOIST to learn more. Quicksilver Engineering's SpeedStand for metal roofs makes protecting workers from falls quick and easy. One-piece stands set up instantly and feature rubber pads that bridge standing seams and ribs and protect the metal finish. The welded-steel stands are spaced 40 feet apart, meet OSHA requirements and can be used on flat roofs, too! They're engineered to save labor job after job. To see why SpeedStand has been the industry standard for 18 years, call (800) 460-7579 or visit qe-1.com.